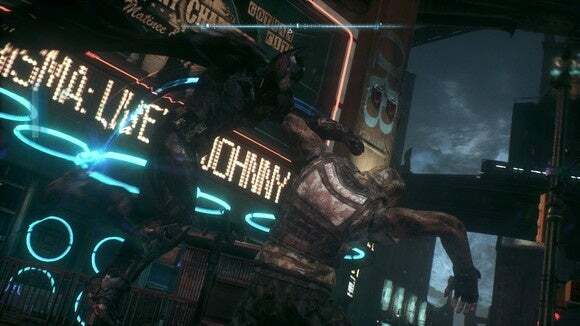 It took four months but Batman: Arkham Knight is officially back on sale—alongside eleven pieces of DLC and a $40 season pass, of course. WB is calling the whole collection of game plus DLC the “Relaunch Package,” but at $90 it’s not discounted from just buying the game ($50) and season pass separately. WB will at least be giving the community some free goodies—though not necessarily ones you wanted. In a Steam post this morning WB outlined its plans, which include a Team Fortress 2 crossover, a free “Community Challenge Pack” DLC coming in January, and free copies of the previous Arkham games. That last one is particularly perplexing, given I don’t know how many people bought Arkham Knight without owning at least Arkham Asylum and Arkham City beforehand. It’s a bit like giving a lifetime supply of chocolate to Willy Wonka. Regardless, it’s here, in the form of a 2.3 GB patch. How does it run? The options menu is a bit more granular, with new options for Motion Blur, Chromatic Aberration, Film Grain, and Texture Filtering. It’s better than before, though I’m still baffled how limited some of your choices are. Anti-aliasing, for instance, is either On or Off. You might also notice that new “Maximum Frames” setting. The console-esque 30 frames per second lock is gone, but there’s still no setting to just unlock the frame rate. Instead, you can choose from 30, 60, or 90 frames per second limiters. That’s plenty smooth, though I’m still a bit miffed I can’t fully take advantage of my 144Hz monitor. It also makes it pretty hard to give you an accurate idea of performance, so I loaded up the in-game benchmark instead, which has no frame rate limiter. 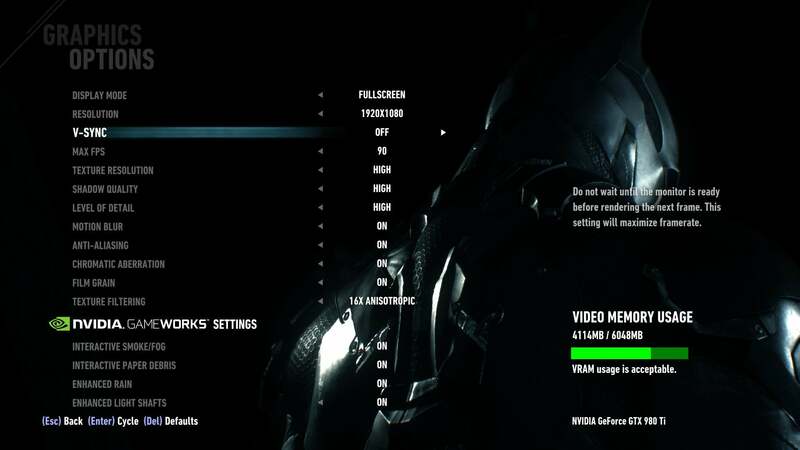 No surprise: Nvidia Gameworks still murders your frame rate. On a 980 Ti at 1080p I averaged 98 frames per second with maximum settings and Gameworks turned off. Turning Gameworks on cut my frame rate by a third, down to an average of 63 frames per second, though the effects sure look wonderful if your GeForce-based hardware can swing it. And that’s for the benchmark, which I think runs a bit better than the actual game. I turned Gameworks off and roamed around Gotham for a few minutes. While I was able to maintain 90 frames per second while moving slowly, flying for long periods of time or jumping in the Batmobile still put a damper on performance, with it dropping as low as 45-50 frames per second at times. That’s a hefty drop, and while the game seems more optimized than it did in June I still wouldn’t say it’s great. It runs, though. Far better than it used to. But what the hell is this? "For Windows 10 users, we’ve found that having at least 12GB of system RAM on a PC allows the game to operate without paging and provides a smoother gameplay experience." I still don’t think Arkham Knight is a particularly good game. The plot is nonsense, the Batmobile is tedious, and the mission design is a chore. 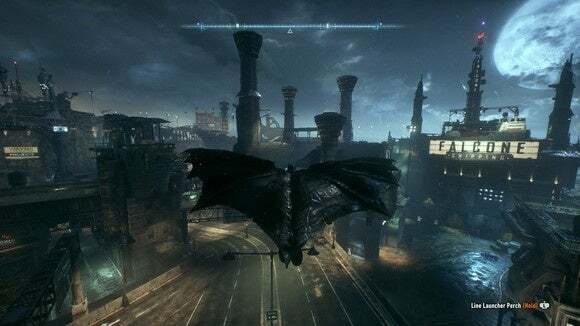 It’s no Arkham City, and it doesn’t even come close to the genius of Arkham Asylum. But it’s a pretty decent Batman simulator, and now it’s a decent Batman simulator that runs as if someone gave half a damn about the PC port. Half a damn. SIDE NOTE: Arkham Knight’s been bugging me all morning saying I’m “running an outdated graphics driver.” Meanwhile GeForce tells me I’m up-to-date. If Nvidia ends up releasing a Batman-specific driver later on, we’ll be sure to update our numbers here.